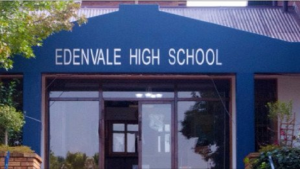 Four suspects have been arrested in connection with Thursday’s robbery at the Edenvale High school, east of Johannesburg. Two alleged robbers were shot dead on the scene and a third wounded during a shootout with the police at the school. One of the suspects approached security guards pretending to fetch his child from the school. After the guards let him in, other suspects entered the school premises. They proceeded to the offices where they held up the principal at gunpoint before robbing him off an undisclosed amount of cash. Also on Thursday, another school robbery took place where an employee of Norkem Park High School was robbed off R25 000 in cash which he had just withdrawn from the bank. Two suspects held him up at gunpoint and took the money as he entered the school. Gauteng police are now investigating whether the robberies could be related. The post Four suspects arrested for Edenvale High school robbery appeared first on SABC News – Breaking news, special reports, world, business, sport coverage of all South African current events. Africa's news leader..